"Antiques Roadshow" is an American television program broadcast on Public Broadcasting Service Public television stations. 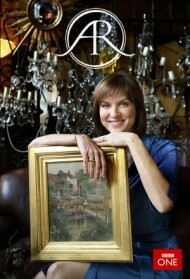 The series features local antiques owners who bring in items to be appraised by experts. Season 22, Episode 29 - "Junk in the Trunk 8"
A 1962 and 1963 Mercury Atlanta number 8 and number 9 archive; a Rasht horse cover that was made circa 1875; a purple sapphire ring. Season 22, Episode 28 - "Somethings Wild"
A collection of critters and creatures including a Colima pottery dog circa 200 BC to 200 AD; a bat-decorated Qing-period jade basin; and an Edgar Brandt "La Tentation" snake lamp. Season 22, Episode 27 - "Kooky & Spooky"
A rag doll named Chucky; a Leonora Carrington painting; a "Bride of Frankenstein" pressbook. Season 22, Episode 26 - "Celebrating Latino Heritage"
Items with a connection to Latin American history and culture include one with an updated appraisal of as much as .2 million, the highest-valued item in the "Antiques Roadshow" archive. Season 22, Episode 25 - "Vintage San Francisco"
An Asscher-cut diamond ring; a Maynard Dixon painting; a San Francisco Seals-signed baseball. Season 22, Episode 24 - "Vintage Birmingham"
An Austrian "Naughty" cat bronze circa 1900; a Margaret Mitchell archive; a Cartier diamond ring circa 1940. Season 22, Episode 23 - "Vintage Omaha"
An Edgar Allan Poe daguerreotype; a Teco collection circa 1905; a 1907 Frank Lloyd Wright archive. Season 22, Episode 22 - "Vintage Chicago"
A 1908 Chicago Cubs presentation piece; a Tiffany & Co. gold necklace; a 1904 Henry Woods oil. Season 22, Episode 21 - "Vintage Portland"
Updated appraisals from 1998, including a treasure with an estimated value that should go somewhere between ,000 and ,000. Season 22, Episode 20 - "Vintage Savannah"
A wedding dress circa 1798; a 1912 Ivan Khlebnikov jewelry casket; a George William Sotter oil. Season 22, Episode 19 - "Vintage Oklahoma City"
Bill Graham handbills; a Galle Marquetry vase circa 1900; art deco travel posters. Season 22, Episode 18 - "Newport, Hour 3"
A Tiffany & Co. sapphire and diamond ring; a Boston bureau table circa 1770; M.C. Escher lithographs. Season 22, Episode 17 - "Newport, Hour 2"
Items include a Fabergé jade snuff bottle made around 1890, Basquiat oil stick drawing, and General Wharton Civil War archive. Season 22, Episode 16 - "Newport, Hour 1"
Items include a diamond pin sway, a Rohmer doll, and Tiffany vases. Season 21, Episode 35 - "Newport, Rhode Island"
Season 22, Episode 15 - "Green Bay, Hour 3"
In Green Bay, items include a Belle Epoque diamond necklace from about 1915, 1952 and 1954 baseball cards, and Cheyenne cradleboard made around 1895. Season 22, Episode 14 - "Green Bay, Hour 2"
Items include a Renaissance-revival poison ring from around 1875, a 1939 Union Pacific premiere banner, and a Harry Bertoia spray sculpture made around 1965. Season 22, Episode 13 - "Green Bay, Hour 1"
Items include a 1967 Green Bay Packers "Ice Bowl" sign, a 1636 Rembrandt "Christ Before Pilate" etching, and an 1849-1850 Gold Rush diary. Season 21, Episode 34 - "Green Bay, Wisconsin"
Season 22, Episode 12 - "Portland, Hour 3"
Uncover West Coast wonders such as a Pablo Picasso "Grand Oiseau Vert" pot, an Ottoman zarf made around 1875, and a Tiffany Studios "Bookmark" desk set from around 1924. Season 22, Episode 11 - "Portland, Hour 2"
Take a passage to Portland to learn more about antique and vintage items like a 1942 Oregon State jacket and Rose Bowl trophy, a Ming Dynasty celadon bowl, and Evel Knievel leathers from around 1967. Can you guess which item is valued for up to 0,000? Season 22, Episode 10 - "Portland, Hour 1"
On this episode, travel to the City of Roses for fantastic finds such as "Heller in Pink Tights" movie credits; a mid-century modern Eero Saarinen Womb settee; and a Lincoln-inscribed photograph from about 1860. Season 21, Episode 33 - "Portland, Oregon"
Season 22, Episode 9 - "St Louis, Hour 3"
Season 22, Episode 8 - "St. Louis, Hour 2"
A Rookwood Shirayamadani black opal vase from 1927; an Elijah Pierce preaching stick; an Ozark Air Lines poster circa 1960. Season 22, Episode 7 - "St. Louis, Hour 1"
A 1901 "Longest Bearded Man" banner; a 1602 Adam Islip-published book of Chaucer's complete works; a 15th-century Chinese Bodhisattva gilt bronze. Season 21, Episode 32 - "St. Louis, Missouri"
Season 22, Episode 6 - "New Orleans, Hour 3"
An Andy Warhol portrait by Jamie Wyeth, circa 1975; a Chinese gold-splashed bronze wine vessel circa 1795; a 1904 Smith & Son tourbillon pocket watch. Season 22, Episode 5 - "New Orleans, Hour 2"
"Blade Runner" set decoration; Agnes Martin mixed-media abstractions circa 1955; feather golf ball circa 1840. Season 22, Episode 4 - "New Orleans, Hour 1"
A diamond bracelet and a Van Cleef & Arpels diamond ring; Mardi Gras Comus Krewe parade float watercolors from 1892; Keith Haring subway graffiti art circa 1980. Season 21, Episode 31 - "New Orleans, Louisiana"
Bracelet and Van Cleef & Arpels ring, Mardi Gras Comus Krewe watercolors, and Keith Haring graffiti. Season 22, Episode 3 - "Harrisburg, Hour 3"
The 1963-1968 NASA archive of U.S. Air Force Col. Pearl Tucker; a painted "Bucher" box circa 1800; Randy Gumpert baseball archive. Season 22, Episode 2 - "Harrisburg, Hour 2"
Charles "Heinie" Wagner Red Sox archive; Carl Schweninger oil painting circa 1850; a 1975 "Yellow Submarine" jacket made for Karen Carpenter. Season 22, Episode 1 - "Harrisburg, Hour 1"
Celebrate Roadshow's new season with a first-time visit to Harrisburg to search for treasures including a Pennsylvania Dutch coffeepot from around 1880, an 1892 H. F. Farny watercolor & gouache painting, and a René Lalique necklace. Which is valued at 0,000-0,000 during an emotional appraisal? Season 21, Episode 30 - "Harrisburg, Pennsylvania"
Celebrate ROADSHOW's new season with a Harrisburg visit and emotional 0,000-0,000 appraisal!. Season 21, Episode 29 - "Junk In The Trunk 7"
Discover never-before-aired appraisals from all six Season 21 cities. Which is the top find?. Season 21, Episode 28 - "Our 50 States 2"
Travel across America - and back in time - with appraisals from all 50 states. One is 0,000-0,000!. Season 21, Episode 27 - "Our 50 States 1"
Celebrate America's hidden treasures from all 50 states, including a 5,000 find. Season 21, Episode 26 - "Vintage Charlotte"
Journey to 2002 to learn how past appraisals fare in today's market, plus a ,000-5,000 find!. Season 21, Episode 25 - "Vintage Kansas City"
Travel back 15 years to see memorable treasures including an appraisal that jumps to ,000!. Season 21, Episode 24 - "Vintage Seattle"
Uncover how appraisals from 15 years ago have held up in the rising and falling antiques market. Season 21, Episode 23 - "Vintage Cleveland"
Learn how the antiques market has evolved in the last 15 years. One appraisal has increased ,000!. Season 21, Episode 22 - "Vintage Austin"
See memorable finds appraised 17 years ago, including one item that adds 5,000 to its valuation. Season 21, Episode 21 - "Vintage Hot Springs"
Season 21, Episode 20 - "Vintage Albuquerque"
Season 21, Episode 19 - "Orlando Hour 3"
Season 21, Episode 18 - "Orlando Hour 2"
Season 21, Episode 17 - "Orlando Hour 1"
Joe Strummer's boots, a Ned Hanlon championship group, and Grant Wood lithograph. Which is 0,000?. Season 21, Episode 16 - "Virginia Beach Hour 3"
Season 21, Episode 15 - "Virginia Beach Hour 2"
Season 21, Episode 14 - "Virginia Beach Hour 1"
John Wayne mugs, a Frank McCarthy oil and Albert Einstein letters. Which is worth up to 0,000?. Season 21, Episode 13 - "Salt Lake City Hour 3"
Watson & Crick-signed ``Double Helix'' books; art deco jewelry suite circa 1930; Japanese Arita porcelain vase circa 1910. Season 21, Episode 12 - "Salt Lake City Hour 2"
Cartier art deco diamond bracelet; Zee Wo Silver & Cinnabar cutlery set circa 1920; a 1959 No. 1 Barbie doll and accessories. Season 21, Episode 11 - "Salt Lake City Hour 1"
Season 21, Episode 10 - "Palm Springs Hour 3"
Season 21, Episode 9 - "Palm Springs (Hour 2)"
A 1966 Roy Lichtenstein screen print; a NASA Apollo archive circa 1965; Tiffany Studios mosaic panel circa 1905. Season 21, Episode 8 - "Palm Springs (Hour 1)"
A 1965 Noah Purifoy sculpture; Carroll O'Connor's Archie Bunker coat, circa 1970; Franz Bergman foundry Vienna bronze lamp circa 1920. Season 21, Episode 7 - "Indianapolis (Hour 3)"
An 1898 Alphonse Mucha JOB poster; a 1974 George Nakashima "Kent Hall'' floor lamp; a 1961 Ty Cobb-signed baseball. Season 21, Episode 6 - "Indianapolis (Hour 2)"
A 1952 Joe Louis-signed whiskey bottle; Sheraton sideboard circa 1820; a 1928 New York Yankees team-signed baseball. Season 21, Episode 5 - "Indianapolis (Hour 1)"
A Rockwell self-portrait, a signed Indy 500 flag, and a Victorian wedding outfit. One's the top find!. Season 21, Episode 4 - "The Civil War Years"
Learn about historical items from on and off the battlefield during the tumultuous Civil War years. Season 21, Episode 3 - "Fort Worth (Hour 3"
An 1864 Civil War statue hilt presentation sword; a 1936 Joe Fortenberry Olympic gold medal; James Madison's personal seal, circa 1828. Season 21, Episode 2 - "Fort Worth (Hour 2)"
Felipe Orlando abstract oil circa 1980; German baroque lockbox circa 1625; Green Bay Packers championship group, circa 1965. Season 21, Episode 1 - "Fort Worth (Hour 1)"
Fort Worth (Hour 1) - Celebrate the Season 21 premiere with treasures like a rock & roll poster collection from around 1968, a Delaware Tribe beaded baldric and an Auguste Rodin "Eternal Spring" bronze that could have the highest value of the season. But is it authentic? Season 20, Episode 29 - "Best Of 20"
Experience favorite appraisals from all 20 seasons, including a 0,000-,000,000 find. Season 20, Episode 28 - "Junk In The Trunk 6"
Travel to all six cities of this season for never-before-seen appraisals and a ,000-,000 find. Season 20, Episode 27 - "Celebrating Asian-pacific Heritage"
Season 20, Episode 26 - "Mansion Masterpieces"
History meets fantasy with treasures fit for a period costume drama, plus a 0,000-0,000 find. Season 20, Episode 25 - "Vintage Boston"
Learn how the antiques market has evolved in the last 15 years, including a 4,000 value increase. Season 20, Episode 24 - "Vintage Miami"
Look back to 2001 to learn what has since happened in the antiques market, plus a 5,000 treasure. Season 20, Episode 23 - "Vintage San Diego"
See memorable items appraised in 2001, including one find with a value increase of ,000. Season 20, Episode 22 - "Vintage New Orleans"
Travel back 15 years to see our take on treasures then and now, including a 0,000-0,000 find. Season 20, Episode 21 - "Vintage Indianapolis"
Travel back 15 years to learn today's values for previously appraised items, like a 0,000 find. Season 20, Episode 20 - "Vintage New York"
Uncover how appraisals from 15 years ago have changed, including a treasure that doubles in value. Season 20, Episode 19 - "Vintage Tucson"
Discover how values from 2001 hold up in today's market and revisit a fan-favorite appraisal. Season 20, Episode 18 - "Cleveland, Hour 3"
Cleveland Hour 3 - Travel to Cleveland to see outstanding vintage finds like a "Big Bronco" coin-operated horse made around 1952, a Bill Watterson archive, ca. 1975, and a Tiffany & Co. pendant watch necklace. Season 20, Episode 17 - "Cleveland, Hour 2"
Season 20, Episode 16 - "Cleveland"
1920 World Series stubs, a Charles Rohlfs music stand and an Ohio portrait. One is the top find!. Season 20, Episode 15 - "Omaha, Hour 3"
A ca. 1804 historical Liverpool jug, a Mormon book archive, a Gilt Bronze mounted gaslight, 1955 Whitey Ford & 1951 Yogi Berra jerseys are among some of the treasures appraised. Season 20, Episode 14 - "Omaha, Hour 2"
Omaha Hour 2 - Discover hidden treasures such as 1955 Whitey Ford and 1951 Yogi Berra jerseys, an 1863 gilt bronze-mounted gaslight and an 1887 Seth Whipple oil painting. Find out which item appraised at 0,000? Season 20, Episode 13 - "Omaha"
A Pete Seeger song, a George Hitchcock diptych and a Lincoln presidential pardon. See the top find!. Season 20, Episode 12 - "Tucson, Hour 3"
Season 20, Episode 11 - "Tucson, Hour 2"
"Tucson" (Hour 2) - Discover hidden treasures in Tucson, Arizona such as a Jackie Robinson archive from around 1938, a 1960 GMT Master model Rolex with the original box and papers, and an Allen Ginsberg-signed yearbook. Season 20, Episode 10 - "Tucson"
A Ginsberg-signed yearbook, an Anna Pottery jug and an Alfons Walde oil. One is 0,000-0,000!. Season 20, Episode 9 - "Charleston, Hour 3"
Season 20, Episode 8 - "Charleston, Hour 2"
Season 20, Episode 7 - "Charleston, Hour 1"
Season 20, Episode 6 - "Little Rock, Hour 3"
Season 20, Episode 5 - "Little Rock, Hour 2"
Season 20, Episode 4 - "Little Rock"
An Olin Travis Ozark hilltop painting, a 1936 Lou Gehrig autograph and an English giltwood cabinet-on-stand, circa 1730 are featured. Season 20, Episode 3 - "Spokane, Hour 3"
Season 20, Episode 2 - "Spokane, Hour 2"
Season 20, Episode 1 - "Spokane"
Season 19, Episode 36 - "Spokane"
Season 19, Episode 35 - "Treasures on the Move"
Season 19, Episode 34 - "Junk in the Trunk 5 (Hour Two)"
Season 19, Episode 33 - "Junk In The Trunk 5"
Discover never-before-aired appraisals from this season's eight-city tour, including a 1925 San Francisco pictorial map, NASA signed photos and a Chinese jadeite peach-form bowl from around 1900. Which is the ,000 to ,000 treasure? Season 19, Episode 32 - "Chicago (Hour Three)"
Season 19, Episode 31 - "Chicago (Hour Two)"
Season 19, Episode 30 - "Chicago"
Season 19, Episode 29 - "Albuquerque (Hour Three)"
A 1962 sonic blue Fender Stratocaster; 1965 Beatles-signed photo and letter; French filigree earrings circa 1775. Season 19, Episode 28 - "Albuquerque (Hour Two)"
A 1969 Jasper Johns flag print; 1939 inscribed ``Pinocchio'' book; Imperial jade snuff bottle. Season 19, Episode 27 - "Albuquerque"
Season 19, Episode 26 - "Vintage Charleston"
Look back to 2000 and learn what has since happened in the market, and a ,000-,000 find. Season 19, Episode 25 - "Vintage Madison"
Season 19, Episode 24 - "Vintage Las Vegas"
See memorable items appraised in 2000; and a jump in value from ,000-,000 to ,000-,000. Season 19, Episode 23 - "Vintage Tulsa"
Discover how values have changed from 15 years ago, and a 5,000-5,000 find. Season 19, Episode 22 - "Vintage Denver"
Season 19, Episode 21 - "Vintage Sacramento"
Discover how values from 2000 hold up in today's market, plus a ,000-,000 value change. Season 19, Episode 20 - "Vintage St. Louis"
Season 19, Episode 19 - "Charleston (Hour Three)"
Season 19, Episode 18 - "Charleston (Hour Two)"
Season 19, Episode 17 - "Charleston"
Oak Ridge Journal archive; Pete Seeger autographed sign; 1854 Edward Beyer panoramic oil painting. Season 19, Episode 16 - "Santa Clara (Hour Three)"
Season 19, Episode 15 - "Santa Clara (Hour Two)"
Season 19, Episode 14 - "Santa Clara"
Season 19, Episode 13 - "Birmingham (Hour Three)"
Season 19, Episode 12 - "Birmingham (Hour Two)"
Season 19, Episode 11 - "Birmingham"
Warhol lithographs; pair of southern dolls; Frederic Remington portrait and letter from the artist. Season 19, Episode 10 - "Bismarck (Hour Three)"
Season 19, Episode 9 - "Bismarck (Hour Two)"
Season 19, Episode 8 - "Bismarck"
A 1939 collection from the rescue operation of a sunken submarine; Torino lamp; two Tlingit Shamanic masks. Season 19, Episode 7 - "Celebrating Black Americana"
An 1821 citizenship certificate for a free man of color; African-American beauty book by Madam C.J. Walker. Season 19, Episode 6 - "Austin (Hour Three)"
Season 19, Episode 5 - "Austin (Hour Two)"
Season 19, Episode 4 - "Austin"
A spinning wheel given by Mahatma Gandhi; Roy Lichtenstein pin; diamond and platinum necklace. Season 19, Episode 3 - "New York City (Hour Three)"
Season 19, Episode 2 - "New York City (Hour Two)"
Season 19, Episode 1 - "New York City"
An archive of rare photographic baseball cards - Roadshow's largest sports memorabilia find ever!. Season 18, Episode 35 - "Manor House Treasures"
Objects fit for stately homes: Lord Byron portrait, Louis Vuitton steamer trunk, Tiffany necklace. Season 18, Episode 34 - "The Boomer Years"
Vintage treasures from the 1940s-60s, including an Elvis standee, MLK letter and Charles Schulz art. Season 18, Episode 33 - "Junk in the Trunk 4, Part 2"
Season 18, Episode 32 - "Junk In The Trunk 4"
Celebrate the trio that provided America's soundtrack for generations. Season 18, Episode 31 - "Jacksonville (Hour Three)"
Season 18, Episode 30 - "Jacksonville (Hour Two)"
Season 18, Episode 29 - "Jacksonville"
Laurel and Hardy "Swiss Miss" horn; Revolutionary War era silver cup; Thomas Hart Benton oil on tin. Season 18, Episode 28 - "Knoxville (Hour Three)"
Season 18, Episode 27 - "Knoxville (Hour Two)"
Season 18, Episode 26 - "Knoxville"
A Tiffany pottery vase; a shoe belonging to the tallest recorded human; a gilt bronze Amida Buddah. Season 18, Episode 25 - "Vintage Des Moines"
Look back on featured items from Des Moines, Iowa, to see if their value has changed. Season 18, Episode 24 - "Vintage Salt Lake City"
Tune in to see what happened to the values of the items found during the trip to Salt Lake City. Season 18, Episode 23 - "Vintage Baltimore"
Uncover some dramatic changes in the value of key appraisals at the first visit to Baltimore. Season 18, Episode 22 - "Vintage Toronto"
Look back at some of the items appraised in Toronto, Canada, in 1999. Season 18, Episode 21 - "Vintage Columbus"
Return to Columbus, Ohio, to learn which items have soared in value and which have sunk since 1999. Season 18, Episode 20 - "Vintage Tampa"
Tune in to see how appraised values in Tampa, Florida, have fared over 15 years. Season 18, Episode 19 - "Vintage Providence"
Look back 15 years to see what some memorable objects appraised in Providence are worth today. Season 18, Episode 18 - "Richmond (Hour Three)"
Season 18, Episode 17 - "Richmond (Hour Two)"
Season 18, Episode 16 - "Richmond"
Albert Neuhuys watercolor; 1982 UNC championship signed basketball; Alice R.H. Smith watercolor. Season 18, Episode 15 - "Anaheim (Hour Three)"
Season 18, Episode 14 - "Anaheim (Hour Two)"
Season 18, Episode 13 - "Anaheim"
A Marx Brothers prop duck; two sketches by Michael Jackson, ca. 1973; a Frederic Church painting, ca. 1867. Season 18, Episode 12 - "Kansas City (Hour Three)"
Season 18, Episode 11 - "Kansas City (Hour Two)"
Season 18, Episode 10 - "Kansas City"
An 1891 Kansas City Fire Chief presentation badge, a 1796 Chinese bronze censer and a 1965 Roy Lichtenstein screen print. Season 18, Episode 9 - "Baton Rouge (Hour Three)"
Season 18, Episode 8 - "Baton Rouge (Hour Two)"
Season 18, Episode 7 - "Baton Rouge"
A French Art Deco diamond and platinum ring, a book signed by Jim Morrison and four Rembrandt and Whistler etchings. Season 18, Episode 6 - "Detroit (Hour Three)"
Season 18, Episode 5 - "Detroit (Hour Two)"
Season 18, Episode 4 - "Detroit"
A 1970 Andy Warhol poster, a collection of Pewabic pottery and a working script of The Wizard of Oz. Season 18, Episode 3 - "Boise (Hour Three)"
Season 18, Episode 2 - "Boise (Hour Two)"
Season 18, Episode 1 - "Boise"
A first edition of the Book of Mormon, Picasso-designed plate and Sanford Robinson Gifford painting. Season 17, Episode 27 - "Finders Keepers"
Season 17, Episode 26 - "Survivors"
See treasures that have endured wars, natural disasters, fires and more. Season 17, Episode 25 - "Junk in the Trunk 3"
View never-before-seen appraisals, including a sports collection and a book with a mysterious past. Season 17, Episode 24 - "Vintage Richmond"
Season 17, Episode 23 - "Vintage Hartford"
See how the values of items appraised in Hartford have changed dramatically - for better and worse. Season 17, Episode 22 - "Vintage Louisville"
Season 17, Episode 21 - "Vintage Rochester"
Find out which item appraised in Rochester in 1998 has increased fivefold and which has lost ,000. Season 17, Episode 20 - "Vintage Milwaukee"
Learn the current value of items appraised 15 years ago in Milwaukee. Season 17, Episode 19 - "Vintage Los Angeles"
Look back 15 years to see what these memorable Los Angeles appraisals are worth today. Season 17, Episode 18 - "Seattle (Hour Three)"
Season 17, Episode 17 - "Seattle (Hour Two)"
Season 17, Episode 16 - "Seattle"
A Vladimir Kagan desk used by Kagan himself and an 1874 Francis A. Silva oil painting. Season 17, Episode 15 - "Rapid City (Hour Three)"
Season 17, Episode 14 - "Rapid City (Hour Two)"
Season 17, Episode 13 - "Rapid City"
A suite of furniture by Thomas Molesworth from the "Ranch A" and signed military documents of Elvis Presley. Season 17, Episode 12 - "Cincinnati (Hour Three)"
Season 17, Episode 11 - "Cincinnati (Hour Two)"
Season 17, Episode 10 - "Cincinnati"
A baseball bat used by Mickey Mantle; Rookwood art pottery; works by artist Edward Henry Potthast. Season 17, Episode 9 - "Myrtle Beach (Hour Three)"
Season 17, Episode 8 - "Myrtle Beach (Hour Two)"
Season 17, Episode 7 - "Myrtle Beach"
Season 17, Episode 6 - "Boston (Hour Three)"
Season 17, Episode 5 - "Boston (Hour Two)"
Season 17, Episode 4 - "Boston"
A Norman Rockwell collection from a guest who modeled for the artist as a child; an Aldro Hibbard oil painting brought in by the mayor of Boston; a Red Sox World Series team-signed ball. Season 17, Episode 3 - "Corpus Christi (Hour Three)"
Season 17, Episode 2 - "Corpus Christi (Hour Two)"
Season 17, Episode 1 - "Corpus Christi"
A Diego Rivera oil painting valued at a million dollars; a 1967 painting by Alexander Calder; and a giant Fisk "Tire Boy" sign. Season 16, Episode 27 - "Greatest Gifts"
Season 16, Episode 26 - "Cats & Dogs"
Take a look at appraisals featuring felines and canines - in sculpture, on canvas and in many other forms. Season 16, Episode 25 - "Junk in the Trunk 2"
Travel with ROADSHOW to enjoy never-before-seen appraisals from Season 16. Season 16, Episode 24 - "Vintage Pittsburgh"
Take a look at what's happened to some Pittsburgh ROADSHOW finds since 1997. Season 16, Episode 23 - "Vintage San Francisco"
Discover which treasures the market favored since ROADSHOW's visit there in 1998. Season 16, Episode 22 - "Vintage Atlanta"
See how some of ROADSHOW's Atlanta discoveries have fared since 1997. Season 16, Episode 21 - "Vintage Houston"
Find out what the future held for some of the treasures ROADSHOW corralled in Houston in 1998. Season 16, Episode 20 - "Vintage Secaucus"
See if the objects found at the Secaucus ROADSHOW floated upstream or downstream in the last 15 years. Season 16, Episode 19 - "Vintage Phoenix"
Flash forward from 1997 for believe-it-or-not ROADSHOW moments in Phoenix. Season 16, Episode 18 - "Minneapolis (Hour Three)"
Season 16, Episode 17 - "Minneapolis (Hour Two)"
Season 16, Episode 16 - "Minneapolis"
A questionable George Elmslie chair that, if authentic, could fetch ,000; a 1900 McKinley-Roosevelt poster discovered at a flea market; and a 1976 fancy intense yellow diamond ring. Season 16, Episode 15 - "Atlanta (Hour Three)"
Season 16, Episode 14 - "Atlanta (Hour Two)"
Season 16, Episode 13 - "Atlanta"
A decorative egg with a Faberge mark that may not be all that it seems; a 1787 land grant signed by Benjamin Franklin; and a New York Chippendale corner chair, circa 1760. Season 16, Episode 12 - "El Paso (Hour Three)"
Season 16, Episode 11 - "El Paso (Hour Two)"
Season 16, Episode 10 - "El Paso"
A 19th-century Fiji split whale's tooth necklace; Andy Warhol's 1966 artist's proof of a print of Jacqueline Kennedy; and a 1937 first edition copy of The Hobbit, with original dust jacket and author J.R.R. Tolkien's signature. Season 16, Episode 9 - "Pittsburgh (Hour Three)"
Season 16, Episode 8 - "Pittsburgh (Hour Two)"
Season 16, Episode 7 - "Pittsburgh"
Correspondence between Cole Porter and actor Monty Woolley; a finely knotted circa 1920 silk Kashan rug; and one of the best flea market finds of all time: a 17th-century Chinese rhinoceros horn cup, purchased for and valued at 0,000 to 0,000!. Season 16, Episode 6 - "Eugene (Hour Three)"
Season 16, Episode 5 - "Eugene (Hour Two)"
Season 16, Episode 4 - "Eugene"
Signed Ty Cobb memorabilia dating back to the early 1950s; an original Rosemary's Baby drawing by art designer Clem Hall; and a 1919 oil painting by Norman Rockwell. Season 16, Episode 3 - "Tulsa (Hour Three)"
Season 16, Episode 2 - "Tulsa (Hour Two)"
Season 16, Episode 1 - "Tulsa"
A signed note from Mother Teresa to a wood-carver; a custom model 1894 Winchester rifle; and a collection of late 17th/early 18th-century Chinese libation cups - grabbing the number one spot on the list of all-time highest value ROADSHOW appraisals. Season 15, Episode 21 - "Forever Young"
Season 15, Episode 20 - "Tasty Treasures"
Season 15, Episode 19 - "Junk in the Trunk"
Season 15, Episode 18 - "Washington, DC (Hour Three)"
Season 15, Episode 17 - "Washington, DC (Hour Two)"
Season 15, Episode 16 - "Washington, Dc"
Season 15, Episode 15 - "Biloxi (Hour Three)"
Season 15, Episode 14 - "Biloxi (Hour Two)"
Season 15, Episode 13 - "Biloxi"
Season 15, Episode 12 - "Billings (Hour Three)"
Season 15, Episode 11 - "Billings (Hour Two)"
Season 15, Episode 10 - "Billings"
Season 15, Episode 9 - "Des Moines (Hour Three)"
Season 15, Episode 8 - "Des Moines (Hour Two)"
Season 15, Episode 7 - "Des Moines"
Season 15, Episode 6 - "San Diego (Hour Three)"
Season 15, Episode 5 - "San Diego (Hour Two)"
Season 15, Episode 4 - "San Diego"
Season 15, Episode 3 - "Miami Beach (Hour Three)"
Season 15, Episode 2 - "Miami Beach (Hour Two)"
Season 15, Episode 1 - "Miami Beach"
Season 14, Episode 20 - "Naughty or Nice"
Season 14, Episode 19 - "Simply the Best"
Season 14, Episode 18 - "San Jose (Hour Three)"
Season 14, Episode 17 - "San Jose (Hour Two)"
Season 14, Episode 16 - "San Jose"
Season 14, Episode 15 - "Phoenix (Hour Three)"
Season 14, Episode 14 - "Phoenix (Hour Two)"
Season 14, Episode 13 - "Phoenix"
Season 14, Episode 12 - "Denver (Hour Three)"
Season 14, Episode 11 - "Denver (Hour Two)"
Season 14, Episode 10 - "Denver"
Season 14, Episode 9 - "Madison (Hour Three)"
Season 14, Episode 8 - "Madison (Hour Two)"
Season 14, Episode 7 - "Madison"
Season 14, Episode 6 - "Atlantic City (Hour Three)"
Season 14, Episode 5 - "Atlantic City (Hour Two)"
Season 14, Episode 4 - "Atlantic City"
Season 14, Episode 3 - "Raleigh (Hour Three)"
Season 14, Episode 2 - "Raleigh (Hour Two)"
Season 14, Episode 1 - "Raleigh"
Season 13, Episode 20 - "BIG & Little"
Season 13, Episode 19 - "Relative Riches"
Season 13, Episode 18 - "Hartford, Connecticut"
Season 13, Episode 17 - "Hartford, Connecticut"
Season 13, Episode 16 - "Hartford, Connecticut"
Season 13, Episode 15 - "Grand Rapids"
Season 13, Episode 14 - "Grand Rapids"